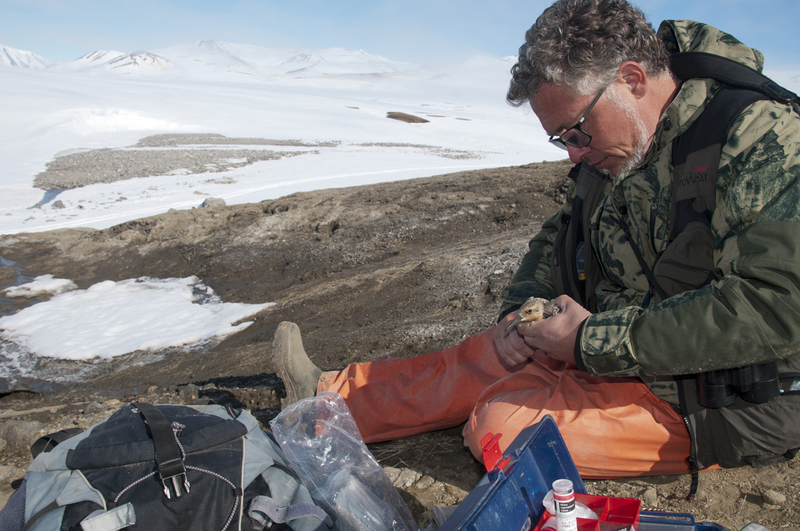 Jeroen Reneerkens of the University of Groningen first studied breeding Sanderlings in 2003, and has continued to do so annually since 2007. He works from the Danish Zackenberg Research Station (74°28'N 20°34'W) in north-east Greenland, which was established in 1996 and is the research base for various experts monitoring the biotic and abiotic environment of the region. Here, Jeroen reports on a remarkable and shocking 2018 field season. 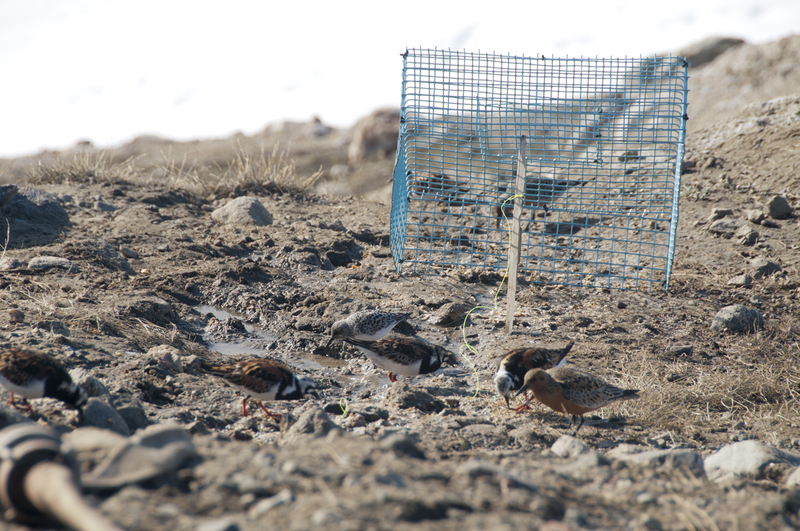 I study how rising temperatures may affect the reproductive success of Sanderlings at Zackenberg, north-east Greenland. 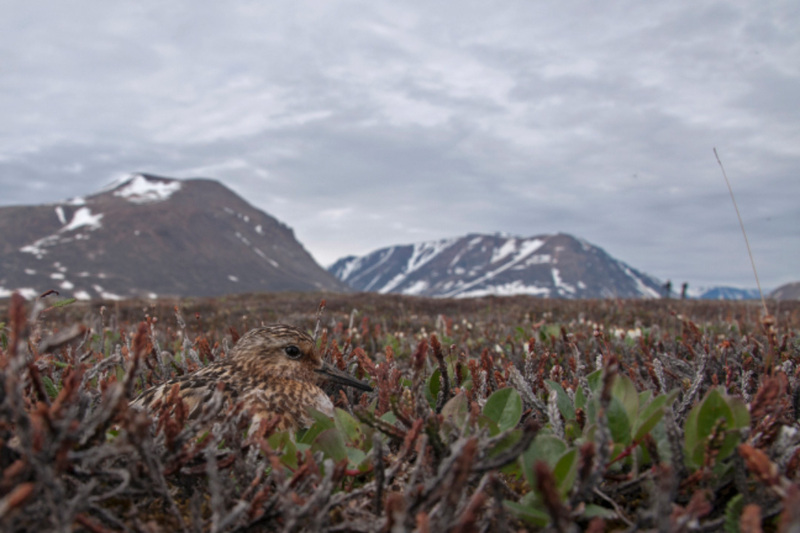 Due to a disproportionate degree of warming in the Arctic, shorebirds that migrate to the Arctic to breed are strongly suspected to be negatively affected by ongoing climate change. Niels Martin Schmidt and his team have indeed established that the summer temperatures in Zackenberg have steadily increased during recent decades. One of the Sanderlings that is part of the long-term study on the species' reproduction in Greenland (Jeroen Reneerkens). The expected consequence of warmer Arctic summers is a mismatch in timing between arthropods (insects and spiders) and their shorebird predators. The emergence of the former in the pitfall traps in Zackenberg has advanced in the last two decades, but I have found that Sanderlings in the area do not adjust the timing of their incubation in response. Sanderlings and other Arctic shorebirds start laying eggs when the snow melts, which usually happens in the first weeks after their arrival in late May or early June. Shorebirds are 'income breeders', which means that females produce their eggs from locally acquired food. Their food appears only when the tundra soil becomes snow free. Snow melts more quickly with higher summer temperatures, but it's not that straightforward as climate models also predict that the amount of winter precipitation (that is, snowfall) will increase. If that is true, more snow may counteract the effects of warming summers on the timing of arthropod emergence. The study area in north-east Greenland. 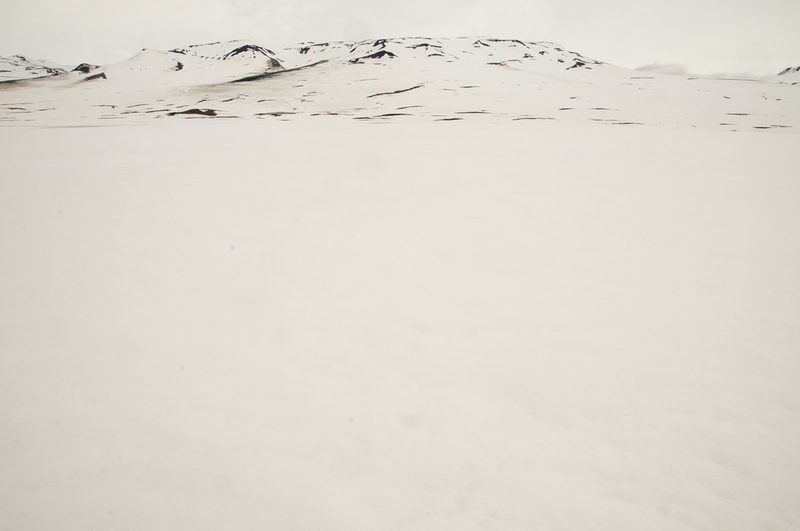 In mid-June 2018 the tundra surface was almost completely covered in snow (Jeroen Reneerkens). 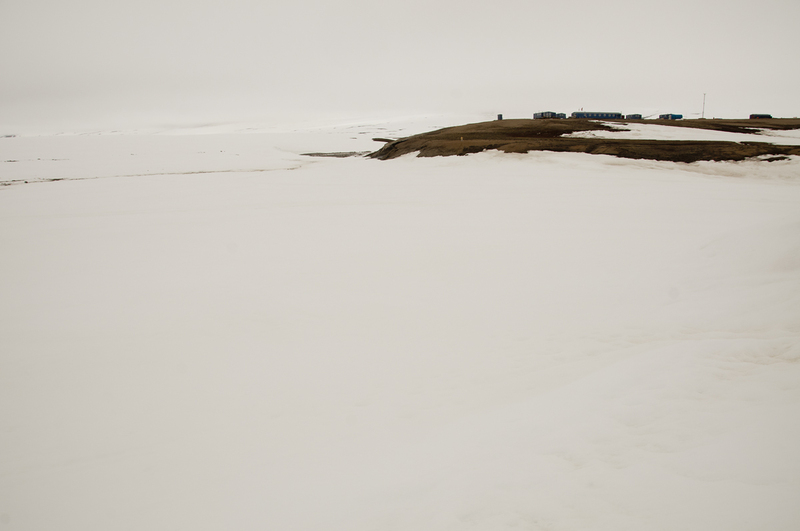 Before I headed north to follow the Sanderlings, my Danish colleagues, who had been in Zackenberg since early June, had already reported that there was a lot of snow on the tundra and warned me that I should prepare myself for a late breeding season. Satellite images from mid-June 2018 show that the tundra surface was close to 100 per cent covered in snow, not only in Zackenberg but also across the entire North-East Greenland National Park. After a delay of two days due to fog in Zackenberg, in which the small chartered planes cannot land, I arrived on 14 June. Most Sanderlings are on their nests by the last two weeks of June, while some late breeders, or birds whose first clutches fell victim to predators, can be found singing or foraging in pairs while the females gather insects to produce eggs. This year, however, the snow was so extensive that the majority of the shorebirds in the valley had flocked together in a snow-free area around the field station. Very lean birds were walking between the wooden buildings in the research station and could be approached up to a few metres, probably because they were not willing to expend their energy and the much-needed time to forage on escaping human researchers. 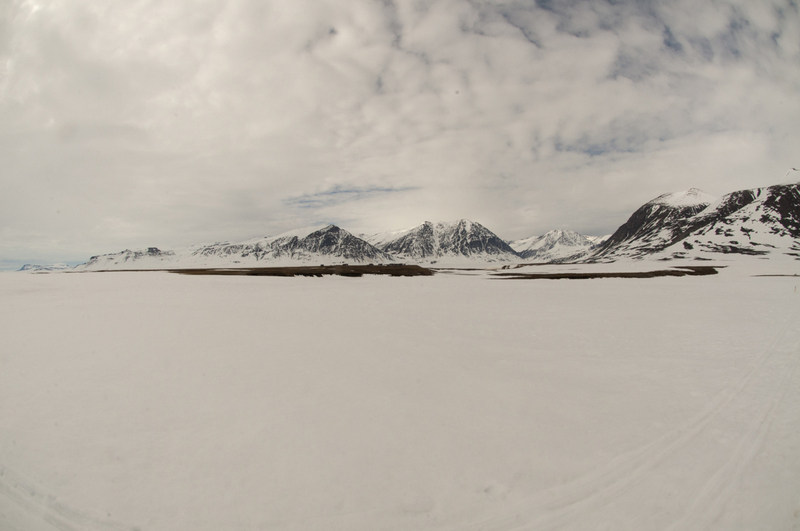 The vicinity of the Zackenberg research station was the only snow-free area in the wide surroundings (Jeroen Reneerkens). It was clear that no shorebirds were going to nest within the next few weeks, if at all this summer. This exceptional situation gave me the opportunity to document the effects of large amounts of snow on the behaviour and condition of the birds. Usually, food leftovers from the station's kitchen are discarded via a hose into the nearby Zackenberg river, so that its smell does not attract Polar Bears. However, the river only started flowing on 20 June – 16 days later than the 1998-2017 average; a new record. The researchers were forced to get rid of the ground-up food on the tundra close to the station. Luckily, it did not attract Polar Bears, but instead a flock of several tens of shorebirds, mainly Sanderlings, Ruddy Turnstones and Red Knots. Ruddy Turnstones, together with singles of Red Knot and Sanderling, foraging at the end of the sewage hose, close to a strategically placed trap (Jeroen Reneerkens). This gave me and my Danish colleague Jannik Hansen, of Aarhus University, the opportunity to catch birds and assess their body condition. We managed to catch 31 Sanderlings, 23 Ruddy Turnstones and 12 Red Knots. Several birds were recaptured up to three times within the following few days. All individuals were in poor condition, with the Sanderlings weighing on average 44 grams (range: 33.6-54.6 grams). To compare, Sanderlings wintering in The Netherlands weigh between 50 and 55 grams and incubating Sanderlings weigh on average 57 grams. Furthermore, these incubating females will have already produced a four-egg clutch weighing around 48 grams before they start incubation! We continued to catch and ring shorebirds from the terrace during the social Saturday evenings at the station (Jeroen Reneerkens). The locally colour-ringed birds were resighted daily near the sewage outlet and between the station buildings, near snow edges. I woke up and went to bed with sightings of colour-ringed birds just a few metres from my bedroom window each day. The food waste close to the station was probably a unique opportunity for the shorebirds, as there is only one village and a handful of stations in the whole of north-east Greenland. The body masses of recaptured Sanderlings showed that many could maintain or even increase their body mass – but not all of them. I found two dead Sanderlings near the station which seemed to have starved. One of them weighed 34 grams at first capture and only 32.6 grams when recaptured a few days later. It was found, without its head, weighing 26 grams. The other Sanderling, unringed but intact, weighed 31.8 grams, indicating that many of the birds were in very poor condition indeed. 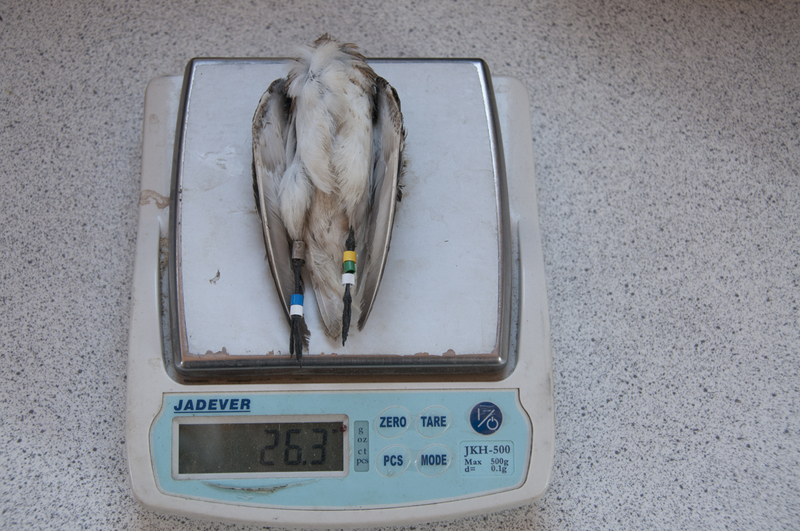 This Sanderling, found starved and decapitated, weighed just 26 grams. Its mass upon capture a few days earlier was 34 grams (Jeroen Reneerkens). I was delighted to recapture a female Sanderling which had I ringed at Zackenberg as a seven-day-old chick on 14 July 2012, meaning it was now almost six years old. Luckily, with a weight of 54 grams, it was among the few birds in good condition. The waste near the station also served as a feeding tray for the local Gyr Falcons. Jannik and I observed one of these large, white falcons hunting shorebirds almost daily, often flying only a few metres over our heads. Although we did not witness a successful attack, prey remains and plucked feathers in the vicinity of the station indicated that either the Gyr Falcon, or possibly Arctic Foxes, were preying on the starving shorebirds. During the two-week period that I was in Zackenberg, I did not hear a single singing Sanderling and only a few times did I hear a singing Red Knot or Dunlin. I observed just two Sanderling pairs, which latterly seemed to have broken up, or at least could not be found again, in the following days. Also, a few flocks of 20-30 Red Knots and Sanderlings were observed heading south at fairly high altitude, suggesting that birds had given up on reproduction this year and were in sufficient condition to migrate southwards again. This appears to have been confirmed by the unusually large numbers of Red Knots and Sanderlings in the UK, Netherlands, Germany and Denmark in late June and early July. Furthermore, we observed surprisingly few locally colour-ringed Sanderlings. Because the species is very faithful to its breeding territories, and given that the snow conditions were similar in the whole range of north-east Greenland, I think that the majority of birds never actually arrived in Zackenberg and instead stayed in more southerly regions with better feeding opportunities. In recent years, Sanderling hatch dates in Zackenberg have ranged between 27 June and 30 July (average 12 July). With four days required to lay the clutch of four eggs and an incubation period of 22 days, this implies that Sanderlings usually start laying around 16 June and, at the very latest, 4 July. Given that on 27 June all of the Sanderling habitat in the Zackenberg valley was still covered by at least a metre of snow, and a more recent report from the Karupelv valley (a more southerly location in north-east Greenland) stating that the tundra is still more than 95 per cent snow-covered in early July, it is very unlikely that Sanderlings, and other shorebirds, will breed this year in Zackenberg, or across the entirety of North-East Greenland National Park. On 27 June 2018, the Zackenberg valley was still completely covered with snow up to a metre deep. The vicinity of the research station visible in the middle of the photo was the only area free of snow (Jeroen Reneerkens). What are the consequences of a non-breeding season for the Sanderling population? This will depend on the scale at which the snow cover has affected Sanderling reproduction. The species' breeding area extends beyond north-east Greenland, and it is possible that Sanderling reproduction will be good outside the area affected by snow this year. I am asking for your help to document the effect of snow conditions on Sanderling reproduction by counting the number of juveniles you see within flocks at your local beaches this autumn. The best way to do this is to repeatedly observe and score the percentage of juvenile birds in the same area between August and November, following a standardised protocol. You can find more information in the Sanderling Ageing Manual, which can be downloaded here. The data can be sent to me via e-mail, while observations of colour-ringed individuals can be reported via AnimalTrack. This article has been adapted from material published on the Team Piersma blog. Team Piersma is a group of researchers working with Prof. Dr Theunis Piersma under the umbrella of Global Flyway Network, a foundation under Dutch law. Their home bases are the University of Groningen, NIOZ Royal Netherlands Institute for Sea Research, and associated institutes along the flyways where the team conducts studies on shorebirds and spoonbills. Find out more at www.teampiersma.org.